Undoubtedly the most popular Antarctic residents, these flightless birds are famous around the world for their unusual looks and unique adaptations. 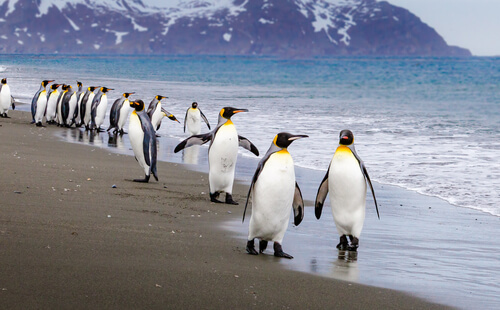 While the Antarctic mainland is the permanent home of just four species of penguin (adélie, chinstrap, emperor and gentoo), the macaroni, king and rockhopper penguins reside in neighbouring islands and venture to the Antarctic peninsula at various times of year. All species of penguins reside in the southern hemisphere, with the exception of the Galapagos penguin. The British Antarctic Survey attributes this reality to the warm waters of the equator, which act as a barrier for the birds. They also theorise that if penguins were to head north, their niche would already be taken by the puffin. Unlike penguins, these black and white birds are able to fly to escape predators, whereas flightless penguins may struggle to survive. As well as being made to live in the water, these adorable creatures have evolved over the years to face the bitter climate of their home. They are extremely fast swimmers thanks to their body shape and solid bones, they can hold their breath up to 20 minutes underwater, and they can drink seawater thanks to special glands that cleverly filters out excess salt. Even their bodies have adapted to the aquatic lifestyle, with glands in their tails producing oil that makes their feathers waterproof. Thanks to the measures put in place to protect penguins and their habitats, populations have surged in the last 100 years. On South Georgia Island, there are huge populations of king and macaroni penguins, while Zavodovski Island is home to the world’s largest penguin colony, with a whopping 2 million chinstrap penguins. Antarctica’s brutal climate is prohibitive for many mammals, but the one that does thrive on the continent is the seal. Six species of seal reside in and around Antarctica: the fur, Ross, Weddell, crabeater, elephant and leopard. 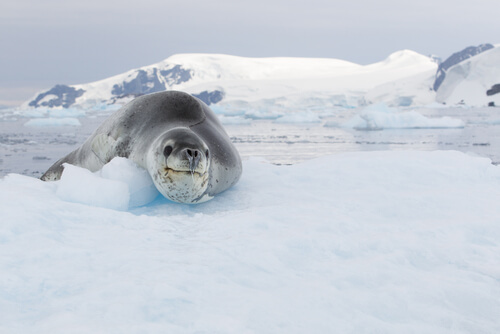 Seals thrive in the southern ocean as they have very few predators; in fact, the Leopard seal is considered an apex predator (or top of the food chain), only hunted by the Orca whale. The leopard seal can weigh up to a staggering 500kg and grow to 3.5 metres in length. In general, they’re opportunistic carnivores, with a typical diet of krill, fish, squid, penguins or even other seals, depending on their preferences and what is available. Just like penguins, seals are well equipped to thrive in Antarctica. Their body shape is streamlined and features four fins, which allows them to navigate the roughest Antarctic waters with relative ease. Seals can also hold their breath for up to two hours, eat underwater without ingesting the salty sea and have slits for nostrils that close in water and block it from entering. Although seal pups are very cute, with big eyes and furry bodies, their personalities evolve as they grow older. In mating season, male seals become aggressive, guarding their harem of females from potential threats, whether they be other seals or curious humans. 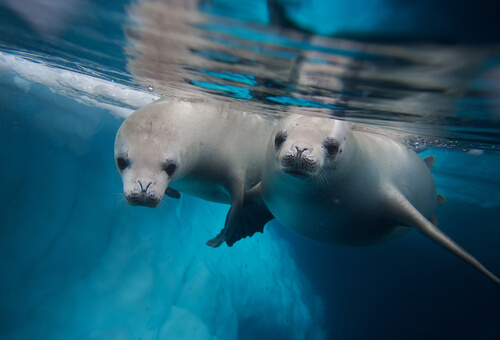 Head into the water and you’ll find female and younger male seals to be playful and curious. Whales are some of the largest and most fascinating mammals on planet earth. Extensive scientific research has revealed that over 50 million years ago, the sea creatures were smaller and land-based. Today, they grace waters across the world and migrate south to the continent of Antarctica in summer, searching for krill and other prey. 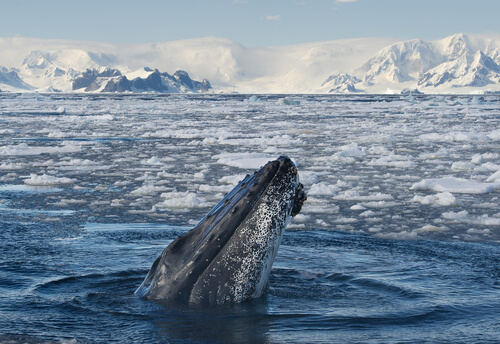 Antarctica is home to ten species of whale: four toothed (southern bottlenose, sperm, orca and southern fourtooth) and six filter feeders and baleen whales (blue, fin, southern right, sei, minke and humpback). Lacking teeth, baleen whales have a plate (called a baleen) in their mouths that sifts krill and plankton from sea water. Toothed whales are able to feed on more substantial prey like fish, squid and in the case of orcas, even penguins or small baleen whales. The whales you will spot on a trip to the Antarctic are highly dependent on the conditions. Weather and season both affect sightings, but sometimes it’s a simple as the animals not wanting to interact with humans. February is one of the best months for whale watching, as migrating whales are usually back in Antarctic waters at this time, after chasing warmer Australian waters in the winter. Look out for sperm, orca, humpback, minke, southern right and mighty blue whales. While penguins are perhaps the best known birds in Antarctica, there are many other bird species – 46 to be precise – that have adapted to life in the Arctic. 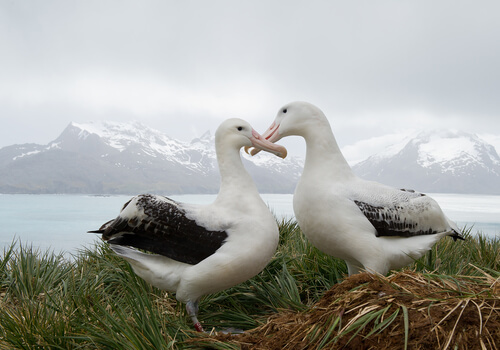 The Scientific Committee on Antarctic Research estimates that every spring, more than 100 million birds breed around Antarctica and its surrounding islands, the most well known being the albatross and petrel. The albatross is the largest flying seabird in the world, with a wingspan that can reach over three metres, allowing them to glide for hours without having to flap their wings. These giants of the sky are found on the antarctic mainland and South Georgia Island in sizeable numbers considering their conservation status ranges from vulnerable to endangered. The largest of the species, the wandering albatross, typically feeds on fish and jellyfish, but it’s not uncommon for them to feast on vulnerable penguins. Coastal bird species in Antarctica, such as skuas, terns and cormorants, forage for food close to the coast. Some skuas hunt fish and krill, while others prey on young Adélie penguins. During your Antarctic cruise, you may see birds following your ship. Many species, such as the cape petrel and south polar skua, are known to track boats for a variety of reasons, the most common being discarded food.